Do You Want The Best Prices On Osmosis Skin Care? My customers have had excellent results using them. If you have any questions, you are welcome to call me on my toll free number or send an email. For Immediate discount, please log in. Once logged in the price will instantly show in the shopping cart. Otherwise you may use the code save if you choose to not log in. 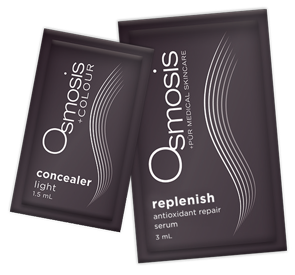 Soon the sample sizes will come in the Osmosis Colour Concealers. Be sure to log in for your immediate discounted pricing. Or you may email me, jmilanent@gmail.com and I will give you a code for Osmosis Express. It is for my customers only to save on Osmosis exclusively. So many people purchase skin care products and jump right in and start using them. That is not the best way to go. Especially if you have sensitive skin. It is best to start slowly. Several times per week, then try it once a day. Once you feel your skin can tolerate a product, you can move to twice per day. That way if you see the signs of sensitive skin, you can back off a little and start again. Relieve is the mildest Retinaldehyde product that Osmosis makes. If you have never used the products, I would start there. If you have Rosacea, then you may want to try Calm. That is made to help improve and remodel skin with Rosacea. Next we have Correct. That is in the same strength as Calm, but it is a little stronger than Relieve, yet gentle to the skin. It is anti-aging and repairing for the skin. All 3 are a perfect way to start your skin care regime with Osmosis. You want to purchase a bottle of Clear also, to help the products penetrate. Also you may use them along with Stem Factor or one of the Catalyst Products.